Cuchifritos presents the exhibition “Yumi Janairo Roth: F.O.B.” featuring recent work by the artist. The exhibition will open on January 16, 2010 from 4-6 and will begin with a panel discussion including Roth, Suzanne Wasserman, Director of the Gotham Center for New York City History, and Nadine Wasserman, Curator of the exhibition. “F.O.B.” has a double meaning. It not only stands for “freight on board” but it is also a term used to mean “fresh off the boat” in reference to immigrants who have arrived from a foreign nation and have not yet “assimilated.” The Lower East Side, a historically immigrant community, is the perfect setting for the body of work Roth created during her recent residency with the Lower Manhattan Cultural Council. During her residency Roth gathered discarded shipping pallets from her Lower Manhattan environs and intricately inlayed each one by hand with mother-of-pearl using patterns gleaned from traditional Southeast Asian furniture and decorative objects. In this way, Roth re-considers a ubiquitous yet most often disregarded object. Given a second life, the pallets become surrogates for the immigrant experience. They are at once local and global. In much of her work, Roth calls attention to objects that might otherwise be overlooked but that influence our lives without our taking much notice. 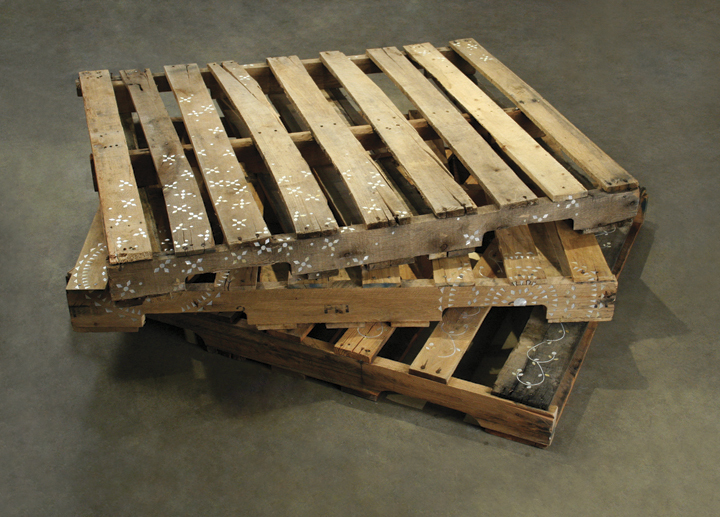 The shipping pallets are re-imagined as decorative objects but since they are still rough, broken, and stained they retain their street cred as the workhorses of global shipping and commerce. In a sense they are symbolic of immigrants and guest workers–uprooted, often invisible, yet indispensable to the world market. Most often generic and nondescript, the pallets, become representative of the way various ethnicities have inhabited the neighborhood, each bringing to it their own food and culture, often shipped from abroad. The Essex Street Market is a microcosm of the many cultures that inhabit the area. Historically it is the descendent of the once ubiquitous pushcarts that were forced indoors by Mayor Laguardia. In the context of the Market, an installation of Roth’s pallets along with photographs of the pallets on city streets illuminates the ubiquity and dignity of these once forlorn and subjugated objects.